eLanka | NATRAJ ACADEMY's TRIBUTE TO LAXMIKANT-PYARELAL! Home ⁄ Event ⁄ NATRAJ ACADEMY’s TRIBUTE TO LAXMIKANT-PYARELAL! NATRAJ ACADEMY’s TRIBUTE TO LAXMIKANT-PYARELAL! It gives me great pleasure to announce that this year’s annual concert by the students of Natraj Academy, will be a tribute to the legendary Bollywood music directors Laxmikant Pyarelal . 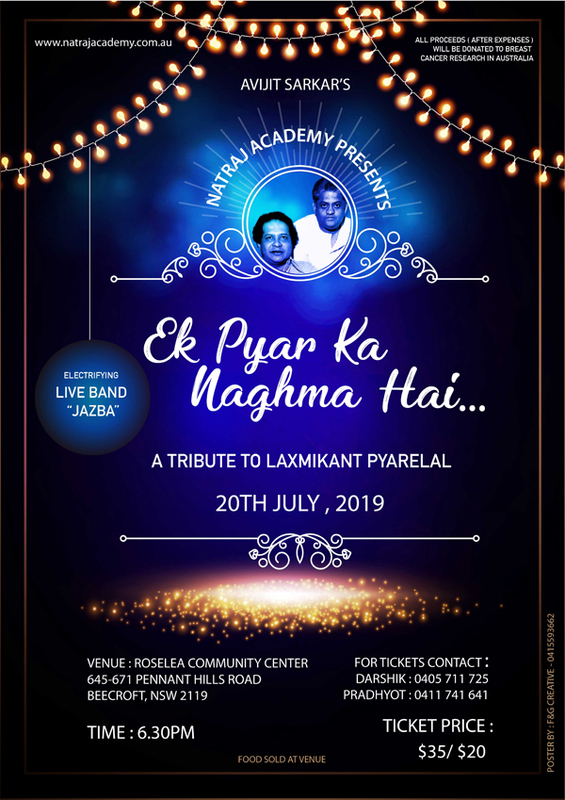 The concert “Ek Pyaar Ka Naghma Hai” will be held on SATURDAY 20th JULY 2019 at Roselea Community Center. Laxmikant Pyarelal have created some of the most memorable Bollywood songs and their biggest hits will be brought to you by the top auditioned voices from Natraj Academy. Backed up by the wonderful musicians of JAZBA and the sound engineering from Abdul Sajwani, this will be a treat for music lovers in Sydney! Natraj Academy’s annual concert has always been a sold-out event and this year, nearly 150 seats have already been booked out. Please email me to reserve your seats at the earliest possible. This event, once again, is for a good cause. The profit’s from this year’s concert will be donated to cancer research in Australia. I am looking forward to your support (as always) and your presence at the concert to encourage some of the finest emerging voices in Sydney. PS: Please forward this flyer to friends who might be interested in attending the event.